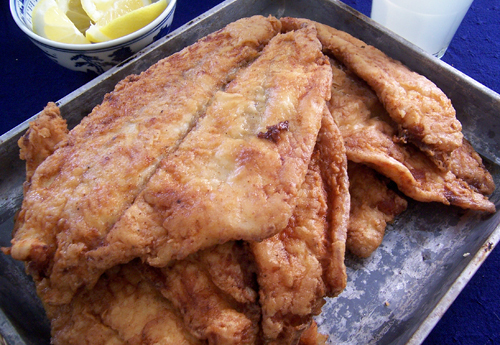 Hill’s Home Market’s Flounder Filets are mild, lean and very impressionable. Its oil content allows accompanying flavors to infuse the flaky meat, and the filets adapt to the seasoning and sauces your family loves. Its versatility also lends itself to a variety of preparation methods and any number of recipes. With flounder, flavor pairings ranging from mild, smooth butter to tart lemon are all fair game. Saute: Season with coarse salt, pepper or herbs. Add 2 tablespoons oil or butter to skillet. Heat oil over medium-medium high, but don’t allow oil to smoke. Place filets in skillet and cook for 1-4 minutes. Shake pan occasionally while the fish is cooking to prevent it from sticking. Turn the fish over and cook for another 1-4 minutes until fish flakes easily and is opaque in the middle.